5th March 2017: Day 4: Sacred Valley (B): Enjoy a walking tour of the town of Ollantaytambo, the oldest continuously occupied settlement in the Americas. Your tour includes a visit to the incredible Incan fortress that overlooks the town. You’re Invited: We will then visit a local community which will give you the chance to meet the students and teachers at the local school and learn about their lifestyle. You’re Invited: Meet a local artisan and learn about the importance of ceramics in Peruvian culture with a visit to Seminario Ceramics. 6th March 2017: Day 5: Sacred Valley – Machu Picchu (B,D): Transfer to the train station and board the Vistadome train for the journey to Machu Picchu. 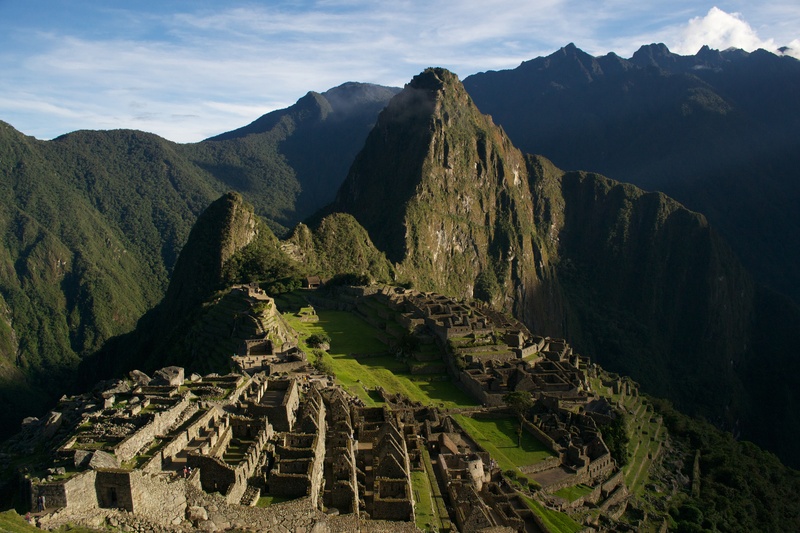 The highlight of the day is your visit to the ancient Inca site. Mystery still surrounds these well preserved ruins perched in between sheer cliffs and your visit will allow you to understand why they are one of the Seven Wonders of the World. Your expert local guide will share stories and knowledge to reveal some of the mysteries of this “Lost City of the Incas”. 8th March Day 7: Cuzco (B,D): Be guided on a walking tour of the charming city of Cuzco, a World Heritage listed site that was a former capital of the Incas. Explore the beautiful main plaza and its surrounding cathedrals. Be guided through cobblestone streets and past ancient Inca buildings to Cuzco’s fascinating central market. Finish with a visit to the Inca ruins on the outskirts of the city including the fortress of Sacsayhuaman. Tonight dine at a local restaurant that specialises in novo Andean cuisine. 9th March 2017: Day 8: Cuzco (B): Today is free to explore the fascinating town of Cuzco. Discover More: Explore the archaeological site of Moray and the salt pans of Maras, take a markets, museums and ruins tour or visit a Peruvian Paso Horse Ranch (additional expense). 13th March 2017: Day 12: Iguazu Falls (B): Iguazu Falls are an incredible sight to behold. Set in a tropical jungle, an enormous river spills over towering cliffs to create a thunderous roar. Cross the border into Argentina for your tour of the Argentinian side of the falls. Board the ecological train and ride to the ‘Devil’s Throat’ viewpoint. Feel the spray of the water and gaze in awe at one of the most spectacular views that Iguazu has to offer. 15th March 2017: Day 14: Rio de Janeiro (B,D): Today we tour the marvellous sights of Rio de Janeiro. Ride the cogwheel railway up Corcovado Mountain and see the famous ‘Christ the Redeemer’ statue. Ride the cable car to the top of Sugar Loaf Mountain for amazing views of the city and landscape. You’re Invited: Have some fun and get to know how the locals party with a visit to the Sambadrome, the site of the famous Rio Carnival where we try on some elaborate and colourful carnival costumes. This evening feast like a local in a typical Brazilian Churrascaria. 16th March 2017: Day 15: Rio de Janeiro (B): Today is free for you to explore Rio at your own pace. Discover More: Take an eye opening Favela tour or relax on a cruise of Guanabara Bay (additional expense). 18th March 2017: Day 17: Argentinian Ranch – Buenos Aires (B,L): Enjoy the tranquillity of the Argentinian outback, explore the farm or take a horseback ride in the morning, then feast on a traditional “parilla” or BBQ lunch before making our way to the sophisticated city of Buenos Aires. With a strong European influence and having enjoyed wealth and opulence once upon a time, Buenos Aires is a wonderful place to discover. 19th March 2017: Day 18: Buenos Aires (B): Get acquainted with this beautiful city known as the “Paris of the Americas”. Visit the central square, Plaza de Mayo surrounded by the Casa Rosada (Presidential Headquarters Office), the Cabildo (Colonial Town Hall) and the Cathedral. Get to know how the locals live as we drop in to a traditional and historical Café. We then travel through the charming streets of San Telmo, the home of Tango and down the colourful roads of La Boca, famous for its multi-coloured houses. Make our way to the famous Recoleta Cemetery, an amazing above ground cemetery lined with mausoleums and statues. 20th March 2017: Day 19: Buenos Aires (B,D): Explore Buenos Aires at your own pace. You’re Invited: This evening we have our last taste of tradition and culture as we soak up the sultry moves of a tango show accompanied by a sumptuous farewell dinner. Discover More: Walking tour to Colon Theatre, cruise through the Tigre Delta or take a Culinary tour (additional expense). 21st March 2017: Day 20: Depart Buenos Aires (B): Transfer* to the airport for your onward flight. Chau!